Many people want to create the classic wedding, with long wedding dress, beautiful veil and, of course, classic and elegant wedding invitations. With the number of styles available in wedding invitations today, it can be hard to decide on what exactly a classic invitation looks like. When you choose the paper, ink and other details of your wedding invitations, try not to get so caught up in what is traditional that you bypass your own personal taste. While these guidelines provide you with some information on choosing simple and elegant wedding invitations, let your taste guide your final decision. If you want bold colors or see a motif you want to add to your invitations, you should do so. The wedding invitation is more than an invitation for your guests; it is a lasting keepsake of your wedding. For the couple that wishes to send out classic wedding invitations, the most common types of paper to use are cotton, linen and parchment. All of these choices fall into the classic style. Cotton is a casual choice, while linen is slightly more formal. However, the most formal choice of these papers is parchment. What color paper should you choose for the wedding invitation? Let your personal preference ultimately guide your decision, but white, ivory and crème are all popular choices. These colors help to create a classic looking invitation which is easy to read and strikes the recipient as very elegant. The color of the ink is another choice to be made when deciding on the look of a classic wedding invitation? If you want a simple but still very elegant choice, you will probably not integrate your main wedding theme colors into the invitation. Stick with black, dark gray or, for the formal wedding, a metallic. The individual items which are included in a simple and classic wedding invitation are very important as well? A response, or RSVP, card is an absolute must. This will (hopefully) help your friends and family share their response to your invitation in a timely fashion. The RSVP card should come with a stamped envelope that has the return address already printed on it. Also include a reception card if you like as well as directions if necessary. What to leave out? Any mention of where the bride is registered. While it has become much more common in recent years to include information on registration information, the traditional advice is still the same. The guests can contact the mother of the bride or a member of the bridal party for registration information; this is typically not included in a wedding invitation. When ordering your invitations, you may choose some other additions as well. First, decide how the seating arrangement will be handled at the reception. 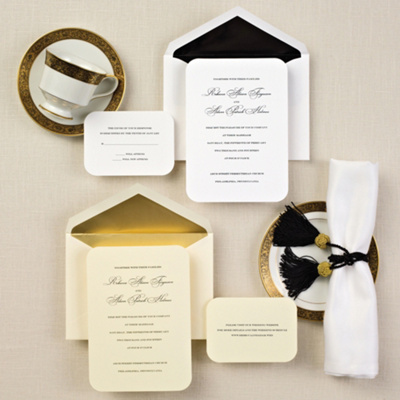 For a classic, sit down dinner, place cards that coordinate with the invitation are a nice touch. To add an additional touch of elegance to the reception, create menu cards for each table, which can also be sent along with the invitations. Finally, if you are expecting guests from out of town, you can print accommodations cards for them, with hotel information, to include in the invitations. Many couples who choose a classic invitation want to personalize it in some way so that it matches the character of the couple and the wedding. There are a variety of ways to personalize a wedding invitation while still maintaining a simple and elegant look. Font style. The wide variety of fonts available can seem overwhelming. To maintain an elegant look, stick with a clean font without an abundance of curlicues. Some elegant font styles include Copperplate and Miss Le Gatees. Liner colors. Choose an envelope lining color that coordinated with your wedding colors without being to bold. A solid color presents a more elegant picture than stripes or patterns. Envelope decorations. For the simple and classic envelope decoration, steer clear of a motif, such as hearts or a church. A simple monogram is perfectly acceptable. No matter how simple you decide to go when choosing your invitations, it is important to let your personality shine through. Your wedding is the first opportunity that you and your fiancé will have to share your joint personality to your family and friends. You should not be so concerned about your wedding theme that you step away from ideas that you love. It is possible to have classic and elegant wedding invitations that sparkle with personality as well. Investing a bit of time to choose the perfect invitations is time which is very well spent. Invitations and wedding favors are two important items which your friends and family, along with your future spouse, can use to remember all of the special moments of your wedding day.